So… Christmas is two days away. Um what? Can we talk about how I haven’t wrapped any presents for my side of the family yet? Which is not a good thing especially seeing as how I have a large family and we’re not talking about just a few little gifts. There are quite a number. I should really get on this. But anyway, we’ve already covered warm, gooey orange cinnamon rolls and now we’re going to cover a fun spin on biscuits. Because eggnog biscuits are better than plain biscuits on Christmas morning, right? I sure wouldn’t mind having a few of these with a big cup of coffee before settling down to open presents. That sounds like a very good plan actually. Now these little babies are nice and flaky … and filled with just the right amount of eggnog flavor. Nothing too overpowering but definitely there. You don’t even really need any butter or jam. Just pop them right in your mouth. Mmmm biscuit bliss. So back to the presents. Has anyone else not wrapped their presents? Can we have a present wrapping party? I’ll bring the biscuits! Or maybe some wine. That may be a better idea. Recipe for eggnog biscuits. 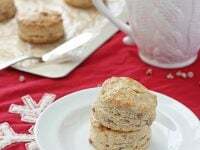 Tender, flaky biscuits filled with just the right amount of eggnog flavor. A perfect holiday morning breakfast. 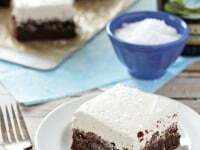 In a large bowl, whisk together both kinds of flour, the baking powder, sugar, salt, cinnamon and nutmeg. Using a pastry blender, cut the butter into the flour. Continue until it resembles even sized crumbs. Add in the eggnog and mix until the dough just comes together. Dump the dough onto a well floured surface. Knead with well floured hands and then pat into a rectangle that is about 6 by 10 inches in size (about 1 inch thick). Sprinkle the cinnamon chips over the dough and then lightly press them into the dough using your hands. Fold the dough as if you were folding a letter (so fold one third over the center third and then the remaining third folds over the top). Use a spatula to lift the dough and then flour the work surface again. Pat the dough into another 6 by 10 inch rectangle and then repeat the folding process. Then repeat this entire process one more time (lift dough, flour surface, pat into rectangle and fold). Dust the work surface one more time with flour and then pat the dough into a final 6 by 10 inch rectangle. Flour a 2 to 3 inch biscuit cutter and then cut out the biscuits from the dough. Space them about 2 inches apart on the prepared baking sheet. Pat together the scraps into a 1 inch thick rectangle and cut out additional biscuits until the dough is used up. Brush the tops of the biscuits with the additional eggnog and then sprinkle with the coarse sugar. Bake for about 15 to 20 minutes, until lightly golden brown. Serve warm. Yield will vary slightly based on the exact size of your biscuit cutter. Adapted from Pink Parsley. Originally from The Lee Bros. Southern Cookbook. Great biscuits! just need some jam and clotted cream! Delicious looking biscuits Ashley! I still have my wrapping to do now…;-) Wishing you a very Happy Christmas! Ashley, I see so many eggnog recipes on my favorite blogs lately, your biscuits are calling my name! 🙂 Did I make anything eggnog? No. But, am I drinking an eggnog latte at Starbucks right now? You bet! 🙂 Merry Christmas and Happy New Year! 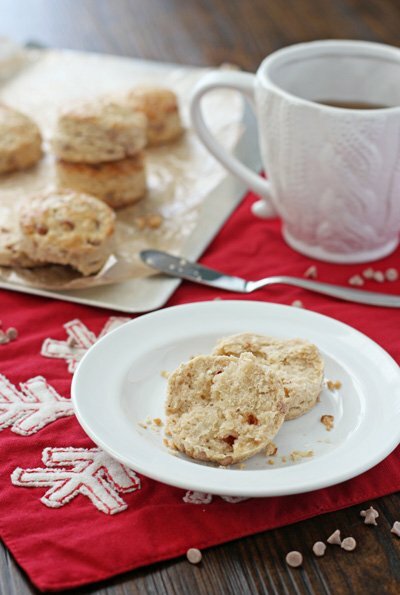 What a great idea – I would have never thought to put Eggnog in biscuits – but I love Eggnog! I hope you have a Merry Christmas! I’m still behind on everything, including baking! I’ll wrap your presents if you make me these biscuits 🙂 Merry Christmas! I just finished the last of my holiday wrapping tonight. Usually, I am excited about wrapping gifts, but this year I just wasn’t feeling it. But I would love to have a wrapping party if it involves wine and treats! Have a wonderful holiday, Ashley! That’s how I feel this year! Usually I really enjoy it but this year … not so much! Happy holidays Ashley! *Puts her hand up* I haven’t wrapeed any presents yet, whooops. Yet I seem to have planned what we’re having for breakfast on the big day like 4587849758924 times. Yeah, food always come first! I wouldn’t mind having a couple of these biscuits on the table, along with a big big mug of warm coffee. They look so delish! Merry Christmas and enjoy your time with your family! Great minds think alike! I finally made it – after 5 hours of sitting at the airport! Boooo! haha Merry Christmas Consuelo! I would love to try these biscuits. I’m usually very behind on wrapping gifts, and by behind I mean Christmas Eve down to the wire! For some reason this year I managed to stay ahead of the game. I wrapped all my gifts in newspaper and it made everything faster – no rolls of wrapping paper to hold open when they keep rolling up and hitting your scissors! These biscuits look like a delicious xmas morning breakkie and very creative much like your cinnamon rolls. Merry Christmas Ashley!! Don’t feel bad, you’re not the only one who’s behind on wrapping presents. And yes, a present wrapping party sounds awesome if there are some wine involved and of course these tasty biscuits! 🙂 I love the idea of eggnog here… makes for the perfect Christmas snack, breakfast, anything really! 🙂 Merry Christmas to you Ashley and have a wonderful week! WOW, the eggnog must give this biscuits a very warm flavor and your kitchen must smell amazing. Have a wonderful holiday! 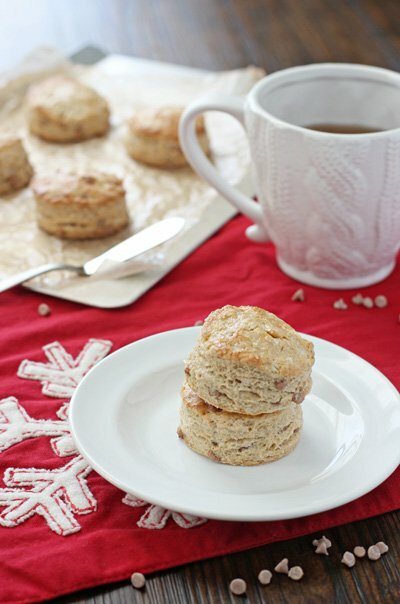 I’ve been in love baking with egg nog lately and these biscuits…just heavenly! I’ve wrapped two gifts and just started shopping 2 days ago. Just a little behind! Hope you’re caught up by now, and I wish you a very Merry Christmas, my friend! Same here – I love baking with it (but not actually drinking it!). Merry merry Christmas to you and your family as well!! I loooove eggnog! These biscuits look fabulous! Gahh I haven’t even started wrapping either! How did Christmas sneak up so fast?! Good luck getting everything ready and have a very merry Christmas Ashley!! I don’t know! I still have so much to do!! Merry Christmas Chelsea!! I’m with you on wrapping presents, I still have my side of the family to take care of! 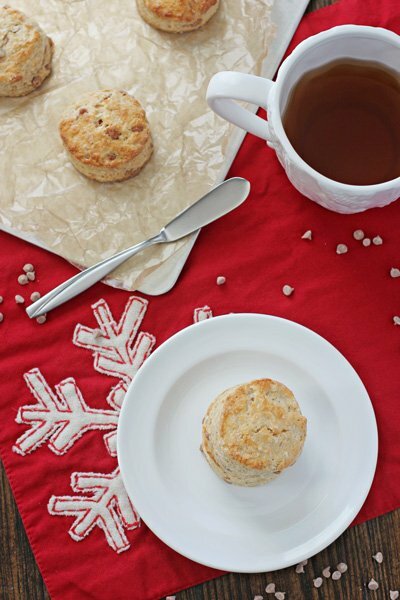 Love that you came up with an eggnog biscuit! It sounds incredible! I hope you have a Merry Christmas! Eggnog Biscuits?!?!?! I have to try these. Thankfully my daughter likes to wrap presents or I wouldn’t have any wrapped! Eggnog biscuits!! This is incredible, and I need one right now! Wow these look fabulous! I know my mom would especially love these as she loves eggnog. And the addition of cinnamon chips sounds perfect! Just done with all the wrapping…well, I am not good at all with that, but I had managed to finish the job. These eggnog biscuits look divine! Once again, have a relaxing and wonderful holiday season, Ashley! These eggnog biscuits are a brilliant idea! Let’s not even talk about wrapping. It has become my least favorite thing, since every single item I have this year is oddly shaped. One actually looks like a house. A freaking house. Instead, let’s talk about these biscuits. I love them and must have them. Delish! Happy holidays! haha I hate odd shaped gifts – impossible to wrap! Good luck and hope you finish everything soon 🙂 Have a wonderful Christmas and holiday with your family Ashley! I thankfully finished my wrapping yesterday! Of course towards the end it became… throw the gift in a bag with some tissue paper. I am usually always in the same situation and my husband ends up doing most of the wrapping around x’mas eve…but somehow we managed to do it early this year! Yay! So now I have time to admire these biscuits. I never thought to use eggnog in these creative ways. Flaky biscuits that are good all by themselves sure sound great! Good luck with all your wrapping! Have a great Christmas, Ashley! I’m jealous! My husband only wraps the gifts he buys for me : ) haha Have a wonderful holiday as well Monica!